ABOVE: A tour boat passes in front of the Lido's main Actv station. Get off here to explore the Lido's shopping, restaurants, and beaches. When you arrive at the Lido's ACTV station, cross the street carefully and continue into the main shopping area. Here, you'll find a small department store, boutiques, cafés with gelato counters, and restaurants. The business district feels lively and prosperous, thanks to tourists in the summer and a year-round population of suburban commuters. Keep walking down the main shopping street, the Gran Viale S.M. Elisabetta. In a few minutes you'll reach the promenade on the Adriatic side of the island. To your right is the former Hotel des Bains (the setting of Thomas Mann's Death in Venice). Farther along the waterfront are the Palazzo del Cinema (used by the Venice International Film Festival) and the neo-Moorish Hotel Excelsior. Just to your left are the Bagni Communale, or public beaches, with bathhouses for day visitors and residents. Walk along the Adriatic in either direction, and wander out on one of the massive stone jetties that help to protect the beaches from erosion. See the Return options page for information on boat service to the Lido from Burano. If you prefer to visit the Lido directly from Venice, you have a number of choices--including the No. 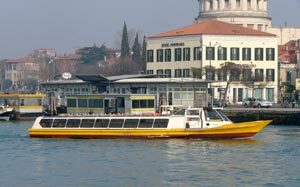 1 vaporetto, the 5.1/5.2 and 6 circolare routes, the double-deck boats that depart from a pier near San Marco, and the 17 car ferry from the Tronchetto parking island. See our Venice Vaporetto Routes article for more information.